You can win the battle with grimy grout lines when you know how to clean grout with an environmentally safe, cheap and natural cleaner that has been trusted to do the job for centuries. 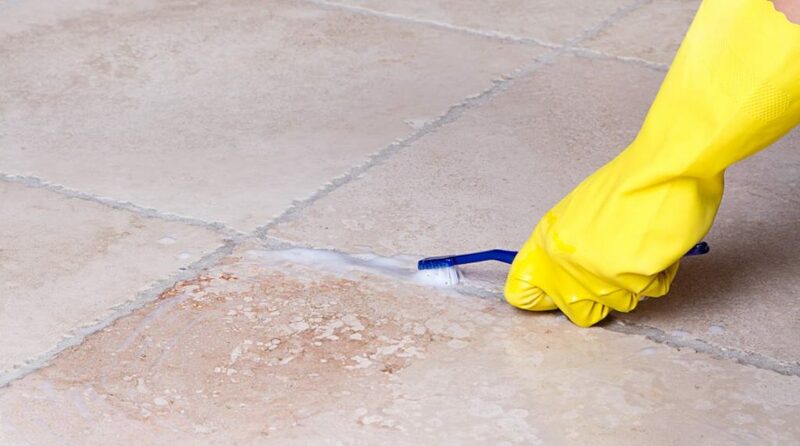 Following this discussion of how to clean tile grout using our top recommendation, there’s a list of solutions for special cases – deep stains, heavy soap scum and other issues that require a tailored approach. Throughout this information, you’ll find recommended products to make your grout cleaning more effective. Our product of choice is distilled white vinegar mixed with water in a 1:1 ratio. This solution hits the sweet spot – more effective on tough dirt than Ph-neutral cleaners while still being gentle enough for regular use. Plus, you won’t be breathing chemical fumes while bringing the brightness back to grout. The recommended tool for cleaning with white vinegar solution is a brush with moderately stiff bristles. The first step is to gather your supplies. Distilled white vinegar, aka acetic acid vinegar: We recommend using food-grade white vinegar to avoid food-prep mistakes. Heinz distilled white vinegar is a quality choice. Stiff-bristled brush: We prefer a brush with a large head because it is versatile. The Oxo Good Grips scrub brush is well-built and durable. If you enjoying having just the right tool for every job, then pick up a brush with a single, narrow row of bristles for more focused cleaning of grout. The Fugenial Tussinator grout cleaning brush is a good choice. These hand brushes require you to be close to the tile, and if its flooring, that means on your hands and knees. If that is difficult for you, then a tool like the Harris Pro Spray will work well too. It has a 26” handle that extends to 42” for stand-up scrubbing of floors or reaching tile on shower walls without having to get into the shower or tub. Spray bottle: Cheap spray bottles cost a couple dollars, but they often lack durability and/or leak. It makes sense to buy a quality spray bottle like the top-rated Harris Pro Spray bottle. Here’s how to clean grout with vinegar. While it isn’t rocket science, taking a systematic approach will yield superior results. Prepare the tile for cleaning. Sweep flooring to remove gritty dirt that might scratch the tile or damage the grout. Dry shower or floor tile to prevent the dilution of the cleaning solution. Mix your solution. Many spray bottles have a 32oz capacity. That’s two cups, so add one cup of white vinegar and one cup of warm water to achieve the 1:1 ratio, cap the bottle, and shake it gently. Harris Pro Spray bottles also have measurements printed on them for easier filling. Set your sprayer to “Spray” mode rather than “Stream” unless you’re a very good shot. It’s important to make sure the grout gets well covered. Allow the solution to work for 5-10 minutes on walls, or as long as it will stay wet, and up to 20 minutes on floor. Spray the tile again, and scrub firmly with your brush or pad. A circular motion works well for grout around small tiles; a back-and-forth motion along the grout likes saves effort when scrubbing grout around tiles 6” square or larger. Rinse the scrubbed area with a method suitable to the location. In a shower, you might be able to use the shower head. On floors, a damp mop or a cloth and warm water work well. The method outlined above will do the job on most dirty grout, but special circumstances arise that require more specific cleaning methods. How to clean stained grout—non-oily: Baking soda is another natural product with a long history as a cleaning product. It’s got some grit to it that makes it a great scrubbing agent. Mix warm water and enough baking soda to form a thick paste. Apply the paste to the grout with a plastic putty knife. Then, spray your 1:1 solution of warm water and white vinegar onto the paste. Apply enough to cause the paste to lightly foam. When it does, scrub it with your bristle brush. Wipe off the paste, and rinse the tile. Arm & Hammer makes quality baking soda. If you’d prefer aluminum-free baking soda, try Bob’s Red Mill. How to clean stained grout – oily stains: These are among the toughest grout stains to deal with. When standard cleaning doesn’t work, try a poultice. This is something of a last-resort method for how to clean stained grout, but probably your best shot at removing deep-set oil from grout or natural stone. TeNax makes poultice powder for mixing your own poultice and ready-made pouches that simply need to be soaked in water and applied to the stain. Follow the directions carefully. It is essential to keep the poultice or powder wet to remain effective. How to clean moldy grout: When gentler approaches don’t work, chlorine bleach is often effective on mold and mildew stains. Repeated use will damage grout, so once it is clean, choose a milder method for weekly maintenance. Soft Scrub gel comes in a bottle with a nozzle making it easy to apply directly to grout. Follow the label instructions for applying, working and removing the cleanser. How to remove soap scum from grout: Get rid of a thick coat of soap scum on tiles and grout with a plastic putty knife like the Red Devil 3” knife. We emphasize that it must be plastic – metal might damage the tile or grout or leave behind metallic markings that only make the cleaning task more difficult. When proven methods for how to clean stained grout don’t work, there are a few other tricks you can use. Grout Pens: These handy products work on grout that is dingy but not darkly stained. They’re a short-term fix when you’re putting your home on the market or about to have guests for the holidays. Grout Pen brand is the most commonly used, and it is available in six colors. The pens cover the grout with paint to create a dramatic difference, so they must be used on the entire floor, wall or shower enclosure. This makes application slow and tedious in large areas, and expensive because you’d need a handful of pens, but is worth considering in limited floor space. Sandpaper: You probably didn’t see this one coming, but fine-grit sandpaper like 3M Aluminum Obyide sandpaper can be a “last-resort” effort on crusted mineral deposits and permanent stains. You’ll have to seal the grout after using sandpaper because you’ll be removing any existing sealer and the top layer of grout. The best method is to get a pencil with an eraser, and cut the sandpaper into strips about the width of the eraser. Wrap the paper over the top of the eraser, and use that as a tool to sand just the grout. Sandpaper is best used on spot stains. It would be very hard work to sand all the grout in even a small shower or bathroom floor. Drill accessory kits: For general cleaning that requires a bristle brush, a drill or driver equipped with a tile cleaning accessory kit might save work and get the job done faster. Top-choice RotoScrub bathroom cleaning drill accessory kit includes a universal steel shank for any drill two types of 4” pads, one coarser than the other. We also like the Revolver Drill Brush kit is a nylon-bristled drill attachment designed for multipurpose cleaning including grout. Drill accessory kits for household cleaning: $15-$40 based on the number and type of accessories. Once you’ve put in all that effort, keeping grout clean will be easier with these basic tips. Apply a penetrating sealer to clean grout now and every year or two. StoneTech Heavy Duty Grout Sealer is a top choice of pros. It costs $16-$20 per quart. Rinse the shower stall and squeegee the walls after every shower to prevent the buildup of soap scum and mineral deposits. The OXO Good Grips Stainless Steel Squeegee with a suction cup holder has a comfortable handle and is easy to use. Sweep and mop your floor tile weekly with a quality floor mop. Always rinse mopped floors with clean water to prevent dirt from being redeposited onto the tile and grout.